You really like your PSKMETER and its great to have perfect signal reports, but gee, it needs its own com port? And if you only have one com port on your laptop, or have used your com ports for other devices, you have nothing left to talk to your PSKMETER. Don't despair! If your computer has a USB port, you can be in business in 5 minutes. Get this handy Serial-to-USB Converter cable and plug one end into your PSKMETER and the other end into the USB port of your computer. Install the driver, and your problem is solved! 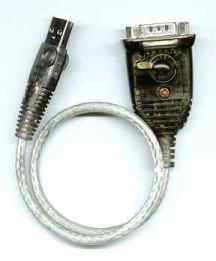 This neat little active converter cable meets the specs shown below, and enables you to operate your PSKMETER, or PSK31 software (like Digipan, for example) from the PC USB port. Also enables the use of a TNC and any other serial comport device. You just might want a few of these in your shack! When you order, drivers for Windows ME/XP/2000 come on a mini-CD that is delivered with the product. If you plan to use the converter with a Vista computer, download the drivers for Vista here.